A button on the case lights up the watch face thanks to an LED powered by a tiny mechanical generator. 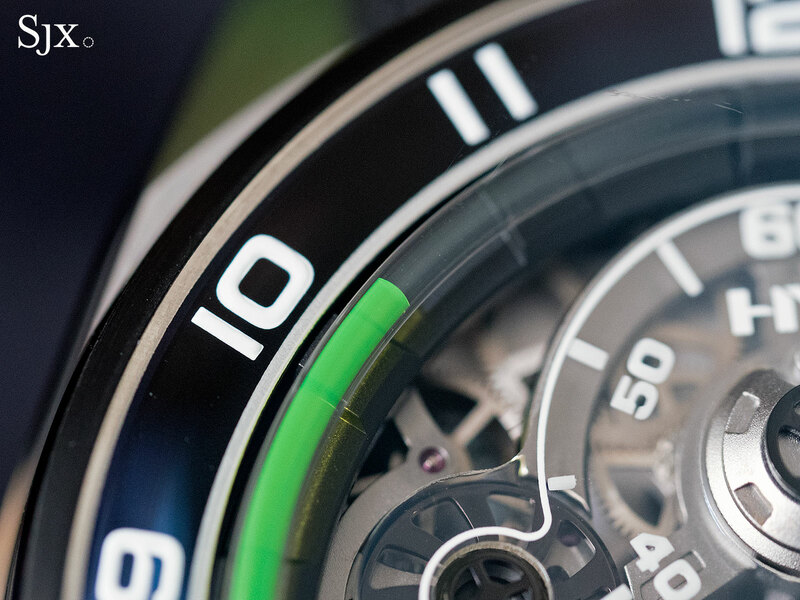 The green liquid that indicates the time on most HYT watches is fluorescent but it does not glow in the dark, though the brand’s chief executive says luminescent liquid is a work in progress. So HYT has developed an alternative, a dynamo-powered LED light that makes its debut on the H4 Metropolis. Hidden underneath the rider tab at six o’clock is a pair of blue LEDs powered by a dynamo. In essence a mechanical generator that produces electricity via a rotating wire coils and a magnetic field, the dynamo is driven by the crown at four o’clock. Winding that crown powers up the dynamo, while pressing the crown activates the LEDs. They light up for five seconds, lighting up the dial from the bottom for some brief but dramatic effect. The light gives the green fluid a truly fluorescent glow. While there’s a hint of gimmickry in the light-up display, the novelty of it is right at home with the liquid time display. 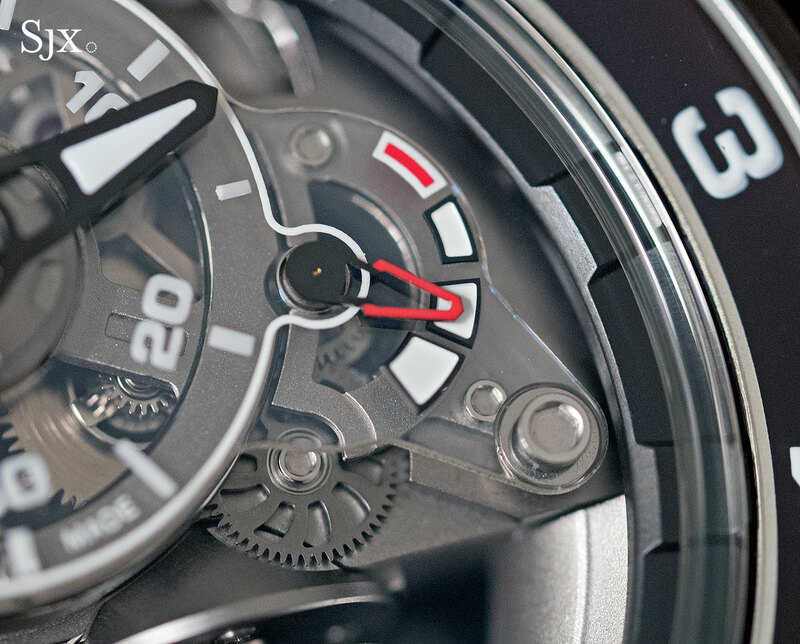 It’s impossible to conceive of the illumination having as powerful a visual effect in any other type of watch. 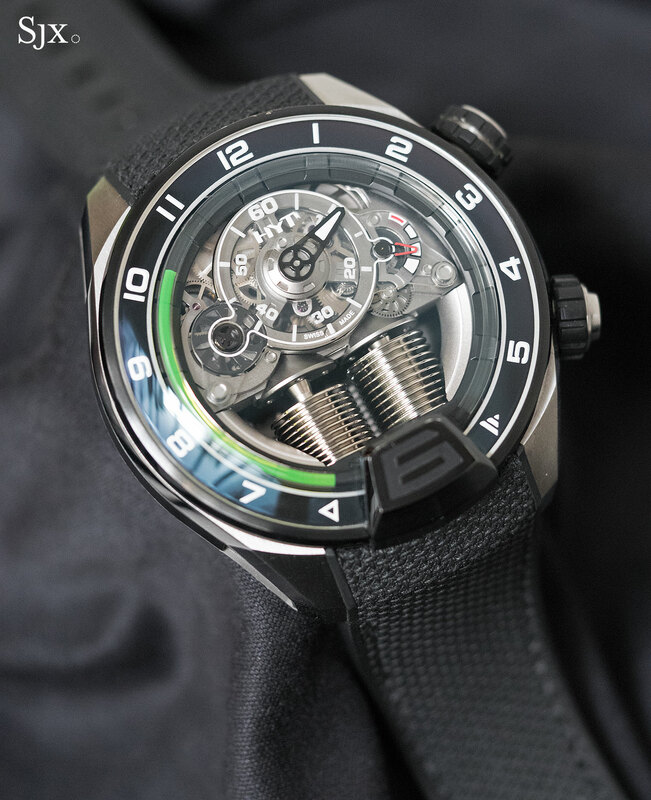 Mechanically the rest of the watch is identical to the HYT H1, but more of the mechanics can be seen on the front because the raised sub-dials are on a single piece of clear sapphire while the bridges below are open-worked. The hours are indicated via the liquid inside a glass vial that circles the dial, while minutes are shown conventionally via a hand on the sub-dial at 12 o’clock. 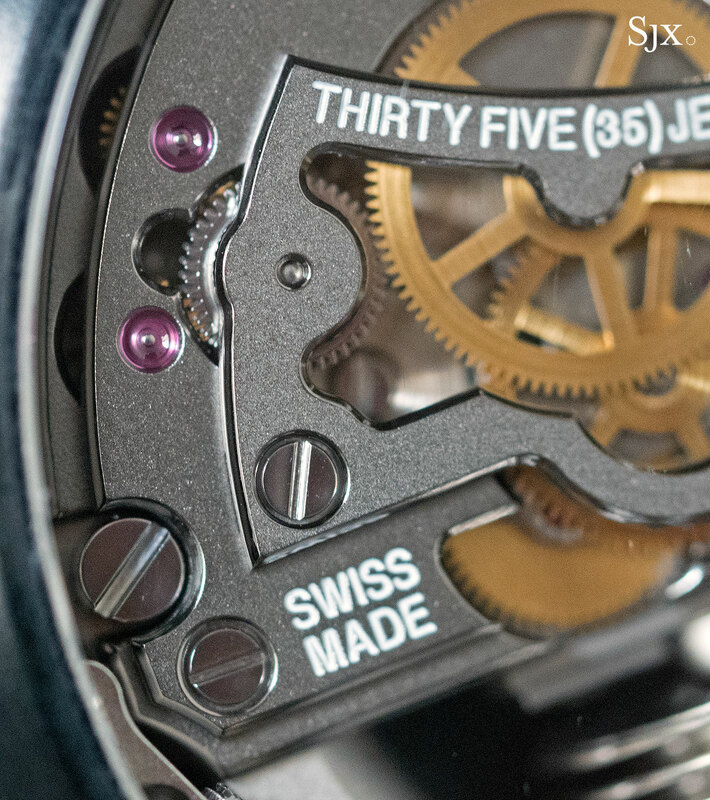 A propellor-shaped seconds hand sits at nine o’clock, while the power reserve is at three. A pair of bellows at six o’clock drive the two fluids inside the glass tube. Because they are oil and water based respectively, the two liquids cannot mix, leaving the meniscus between the two to point to the hour. The bellows push the meniscus forwards clockwise as time passes, and once it reaches six o’clock, the reverse happens. The meniscus is pushed backwards in an instant before starting again like a retrograde hand. 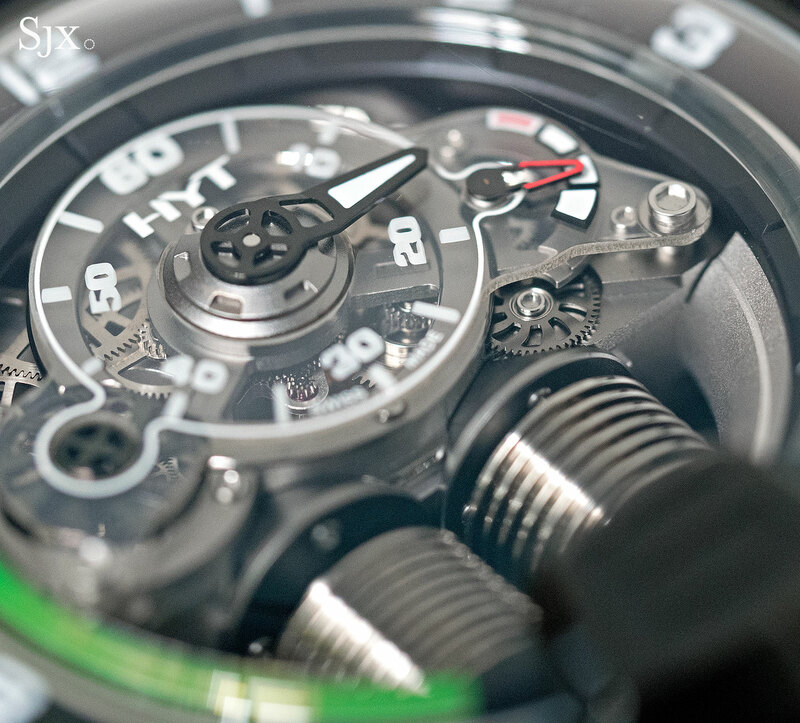 Typical of HYT, the watch is a large 51mm in diameter, but lightweight as the case is titanium, with the bezel coated in black diamond-like carbon (DLC). 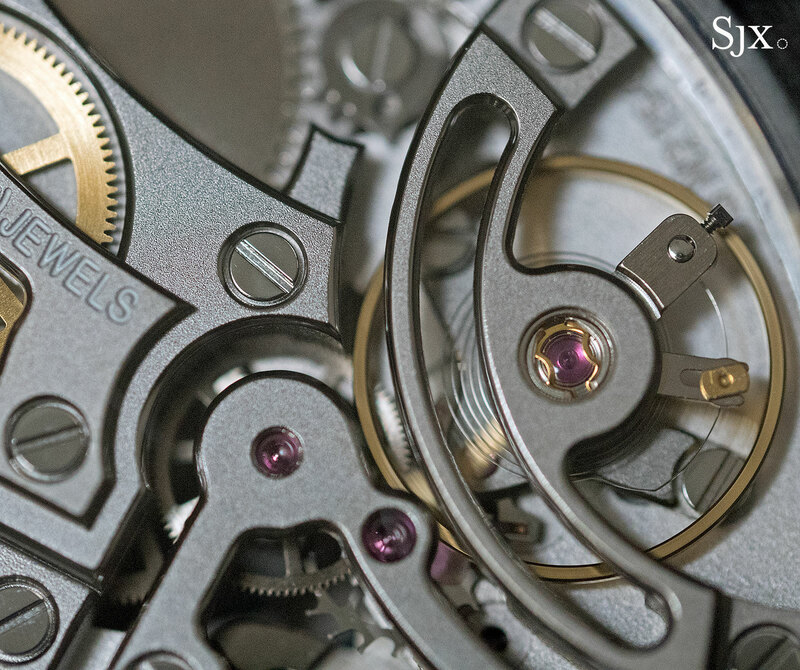 The case back is sapphire, revealing the movement, which is identical to existing an calibre but finished differently. Hand-wound with a 65-hour power reserve, the timekeeping part of the movement is actually relatively compact, taking up only half the volume inside the case. That portion was constructed by complications specialist Chronode, while the liquid pumping mechanism was devised in-house by HYT. 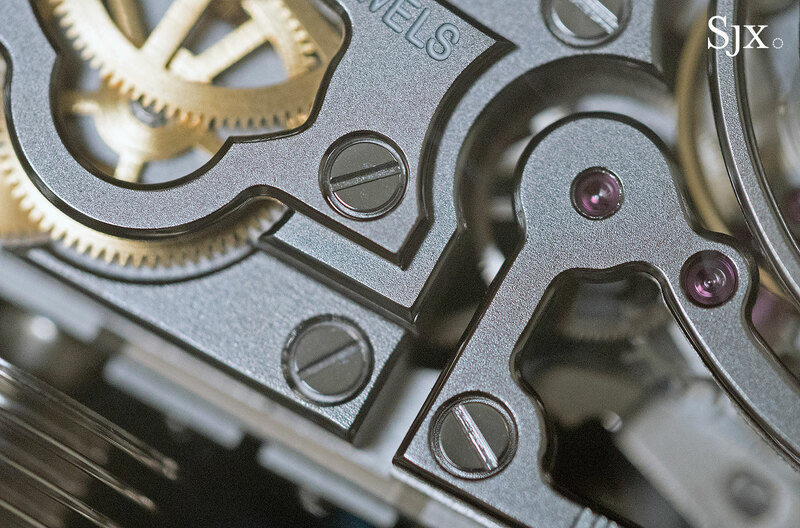 Notably the movement is finished differently, and more attractively, than the usual HYT calibre. Instead of the usual silvery rhodium-plate with Geneva stripes, the bridges have frosted, leaving them a shade darker. That contrasts well with the polished, bevelled edges, which appear mechanically applied but are visually appealingly. 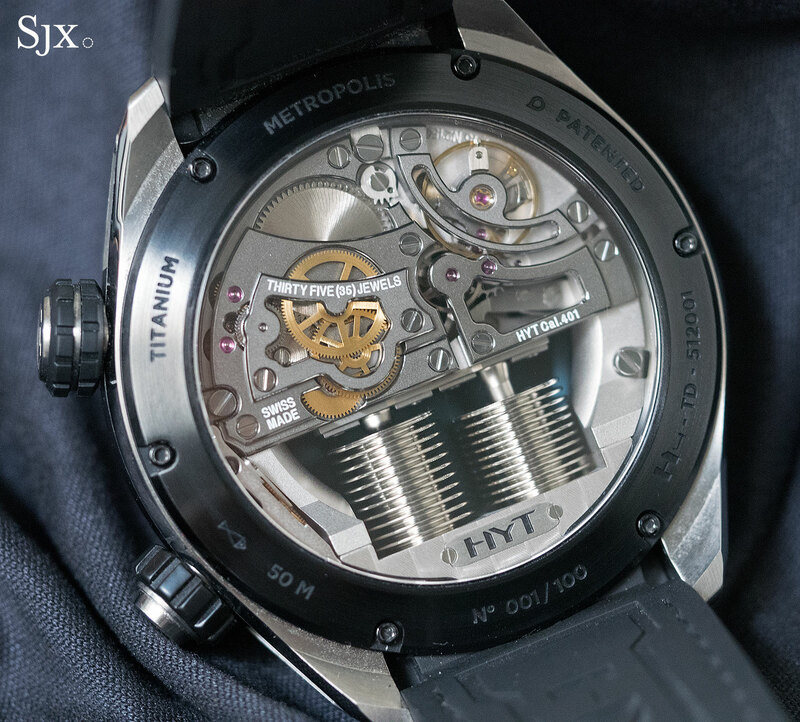 Limited to 100 watches, the H4 Metropolis (ref. 512-TD-45-GF-RN) is priced at US$94,000 or S$127,000. It’s available from HYT retailers. 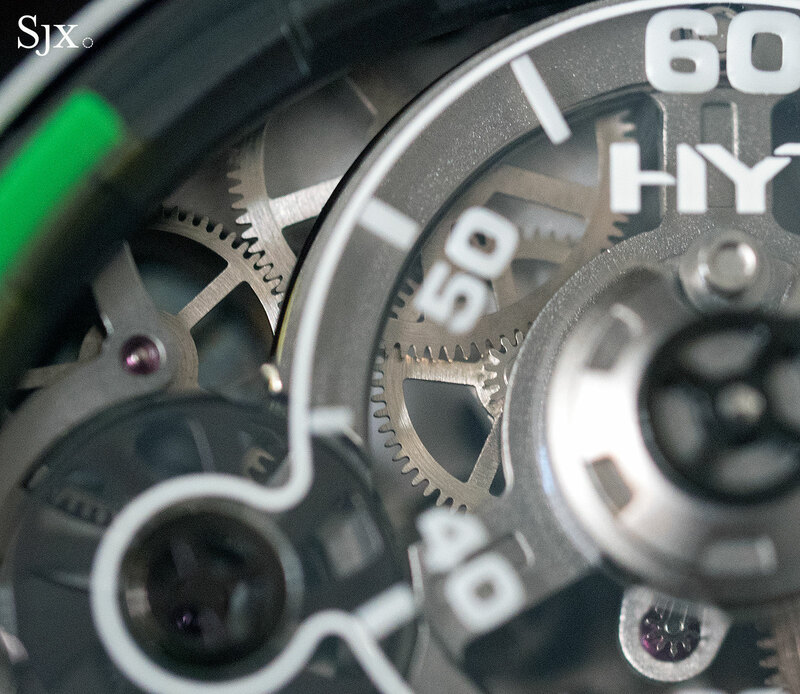 HYT marks its third year with an entry-level limited edition, the H1 Colorblock.